This grey t-shirt features recognisable villains from the Batman movies, with the superhero himself looming over them. 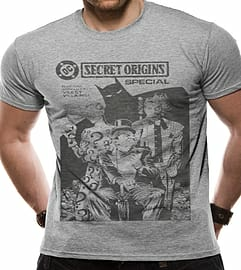 This DC Secret Origins Special is a comfortable and well-fitted t-shirt that is a great buy for anyone who loves the Batman films. Buy the Batman Vile Villains t-shirt today!